2. After you've posted your blog, sign the MckLinky below. Have fun exploring the other links as well! Please sign in only if you're participating. Hopefully this will make us look at things through fresh eyes throughout the week. Spring makes everything seem so fresh and pure again. A new start for each flower and blade of grass. And I pray that God continues to refresh and renew my heart, making it pure and loyal. I really link Easter with spring..
Everything comes back to life again. 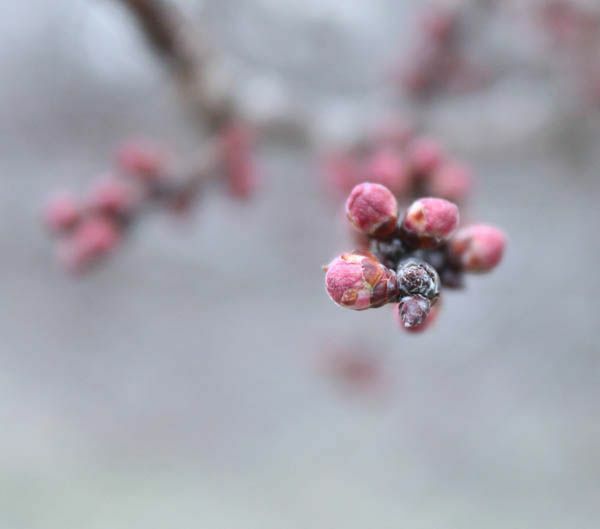 Just beautiful seeing the buds getting ready to open. We don't have any yet, but soon, I hope. You're right. Everything is fresh and new. How peaceful. I agree with you about spring and my prayer is yours as well. Really beautiful photo! Springtime is my favorite season and the beautiful little buds make me so happy. May we all be renewed. Simple and beautiful. Great verses. Beki, thanks so much for doing this every week! It's such a blessing! You are busy but I have a question that your fingerprint verse raised. Never before has it occured to me that God could cast me from His presence or take the Holy Spirit from me.....do you think this could be true? Obviously, it is in the Bible, it must be, but this makes me a bit uncomfortable. Does anyone out there want to take a stab at interpreting this verse and most importantly for me, reassuring me that this is an eternal relationship and I don't need to fear being cast away or having the Holy Spirit taken from me. I acknowledge my transgressions nad my sin is always before me, Against you and you only have i sinned. God will not just randomly cast you aside. He loves you and wants a close relationship with you. If you read verses in the context in which they are written instead of just one verse you will find your answers. I think it's a pleading prayer. I think David is pleading for the Lord to fill him and be his all...never to leave him. In Psalm 51, he's asking for forgiveness...he's filled with shame and is making amends, and is deeply asking the Lord to be with him always. Romans 8:38 says: "And I am convinced that nothing can ever separate us from God's love. Neither death nor life, neither angels nor demons, neither our fears for today nor our worries about tomorrow--not even the powers of hell can separate us from God's love." If you read the entire chapter of Psalm 51, this is David seeking repentance and deliverance from God after his sin with Bathsheba was revealed. I believe David is begging and pleading with God to not cast him away because of his sin. He is begging for cleansing, forgiveness, and compassion. Jesus was always very clear about the way of salvation. Trust in him and be saved. The Bible states in Mark 3:29 that the only way to lose your salvation is to blaspheme God. Take heart and boldly proclaim who you are, a child of God, now and forever. Anon: God will never leave those who invite or ask for His presence. This Psalm is just that, asking for God's presence. God has not forsaken you, since in asking the question, you are seeking God. I agree with the above explanations of the verse. God is always there, we are the ones that choose to either step away OR draw closer to Him. This psalm is a cry from David and a plea for forgiveness after his sin with Bathsheba. I agree with the previous comments . . . David is writing after committing adultery and murder, for which he most likely deserved death, so he us in a very desperate place. Also, he is in a pre-Jesus Old Testament context, so that's informing his language here. We know that Jesus says in John 10 that nothing can pluck his sheep from His hand, we have that great Romans verse the last comment referenced. Another thought us that he may be be speaking relatively not absolutely, if it is possible for the holy spirit to come upon someone or to fill someone (like in an inspirational psalm writing moment for David) is it possible to be "not filled?". For someone like David who had such a close relationship with God it must have been painful to have that separation even of his own making. I think the answer lies in david being called a man after Gods own heart even after went through these dark places of sin and grieving. What a merciful God! Thank you guys for the great comments today! It was definitely an apology and plea from David to God. He was desperate for forgiveness. I was having a hard time coming up with words, so thank you to everyone else who commented on this! Spring has always been my favorite season, all the life reappearing and everything reminding me of rebirth. beautiful post and the image is wonderful- I can't wait for blossoming trees. Thank you for everyone's explanation. I feel better, although still a bit haunted by the possibility that is revealed in that verse. I will, this weekend, read the whole Psalm for context.